This super-easy paperwhites kit produces pretty, star-shaped blooms that banish winter blues. It's the dead of winter. The holiday festivities are over. January, February, and March loom somberly ahead. The world looks grayed out and your soul feels a little gray, too. When it's hard to believe spring will ever come, this fragrant array of delicate, star-shaped flowers on slender stems will refresh your faith in Earth's renewal. Within weeks, these three premium paperwhite bulbs will produce fragrant, pure white blooms on multiple stems. 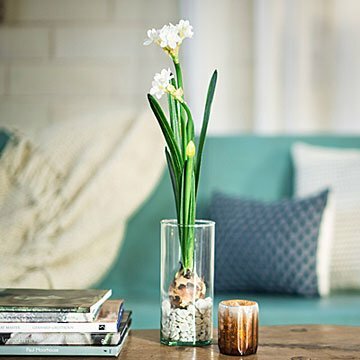 The stylish glass vase lets you see the green stems shooting out of the bulb, even before their blossoms appear. Includes bulb, vase, recycled glass growth medium, and simple instructions. Paperwhites have minimal light and water needs. Made in the USA of domestic and imported components. Click here for Growing Instructions and Frequently Asked Questions. Just add water. Grow time: 4-6 weeks. Bloom time: 2-3 weeks. Kit Includes: recycled glass growing medium and three premium Paperwhite bulbs in a burlap bag.